PR Week has been the trade paper of the UK public relations industry for as long as I can remember. And that was its problem. Coming from the stable that also published Campaign, it understood agency dynamics – the process of pitching and sometimes winning new business, of hiring new staff, of creating campaigns and winning awards. That perspective works well for the ad industry, since almost all of those involved work on the agency side. But it led to some major blind spots when reporting on public relations: it undervalued the role of corporate comms practitioners including internal communicators (mostly working in-house), favouring the picturesque over the complex, the output over the outcome. By taking a trade paper perspective, it had a blind spot over public relations education (a large sector) and of challenging discussions around the professional project (boring and uncommercial). New books were rarely reviewed in the weekly format, and academic books were viewed dismissively when there was more space in the monthly edition. I couldn’t find a single academic or educator listed in the recent PR Week Power Book. Looking back over my 25 years as a reader, all the memorable issues have been in the monthly format. 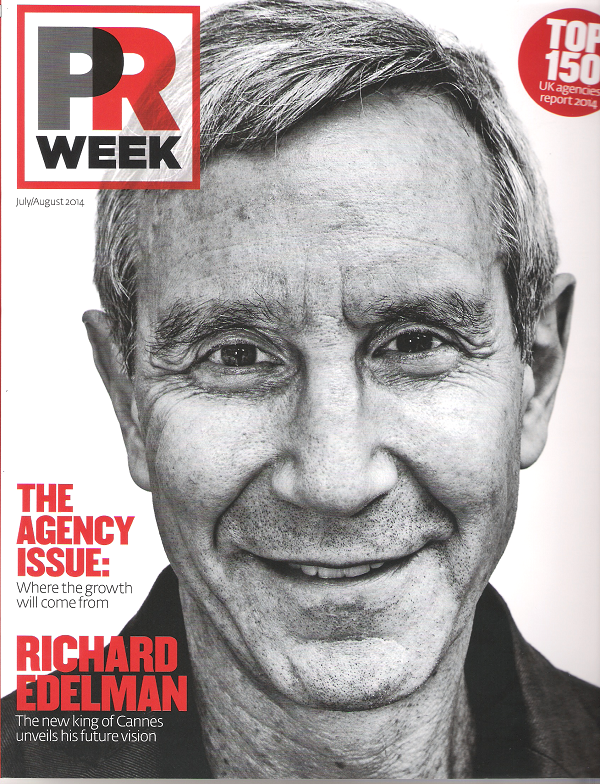 I’ll be keeping the July/August 2014 ‘agency issue’ featuring Richard Edelman plus the top 150 agencies (see picture) and the October 2014 ‘integration issue’ featuring Sir Martin Sorrell. Danny Rogers, having also edited Campaign, was on the ball in noting the blurring lines between advertisers chasing earned media and PR practitioners buying paid media. I’ll miss that – but have decided not to pay for more of it as I can and do read Edelman and Sorrell’s thoughts elsewhere. I can read people’s opinions on their blogs, and there are some excellent debates on LinkedIn and on grown-up blogs such as PR Conversations. We don’t need more of this. I’ve grown out of a trade paper because it no longer reflects what I do or what I’m interested in. I still wince at the use of ‘agency’ to mean ‘consultancy’, but have had to accept that some battles are not worth fighting. But I’m not yet quite ready to ditch ‘industry’ for ‘profession’ because I feel that would involve too much spin. But I can agree that we’re on a journey of professionalisation. So here’s my challenge to members of the CIPR, who have signed up to the professional project. We can get our news and our gossip online. We can have some enlightening (and some irritating) debates on social media. But what we can’t always get from this is perspective. We need something less hectic (in annual or quarterly format) to provide a deeper analysis of trends, to look at the currents beneath the frothing water. We need practitioners to teach educators about what’s new in their work, and for educators to teach practitioners about new thinking and new research. We need a record of achievements: new members, new fellows, New Years honours, senior appointments. We need a place for obituaries. We need a debate about the future of the ‘profession’ and its representative bodies. Do we really need a CIPR, a PRCA, an IoIC, an APPC, a PR Guild and all the others? Are we still a trade, or worse, multiple trades? We need reminding who we are, what we do – and why it matters, and where we’re going (as well as where we’ve come from). It may sound dull to some. But are we ready for a professional journal? Great post Richard and I agree. I will miss some elements such as the case studies sections which I always liked to read and share with my students. I also quite liked the way the publication challenged the industry and would follow leads when it heard something was afoot at agencies. It did cause a stir or two but that’s what a trade title should do I think. That’s part of the problem: we have academic journals for the few, and trade publications for a larger readership. But there’s no common ground. The feeling here (I’m writing from a UK perspective) is that we need something that bridges the two worlds/cultures and reflects the professional journey that individuals and institutions are embarked on. In the meantime, as well as PR Conversations (mentioned above), I should add prredefined.org as a good example of the discussions we should be having. Thank you for suggesting prredefined.org, but after looking through I am more confused than ever. If PR, content creation, SEO, social, marketing are all separate but overlapping why don’t we create a new term for real life, for the people who in reality work across all areas? And if we did what would it be called. Those are exactly the questions people have been grappling with at prredefined.org. Also see Stuart Bruce’s recent post on his blog and LinkedIn. The definiton of PR is not a purely academic question because it concerns real jobs, future careers and the services sold to real clients. It also concerns the shifting boundary between PR and marketing. My purpose in the post above was to ask for a less hectic forum to reflect on these questions. I think a yearbook (in print!) might be suitable.